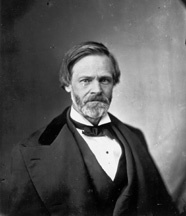 SHERMAN, John, a Representative and a Senator from Ohio; born in Lancaster, Fairfield County, Ohio, on May 10, 1823; attended the common schools and an academy in Ohio; left school to work as an engineer on canal projects; studied law; admitted to the bar in 1844 and began practice in Mansfield, Ohio; moved to Cleveland, Ohio, in 1853; elected as a Republican to the Thirty-fourth and to the three succeeding Congresses and served from March 4, 1855, to March 21, 1861, when he resigned; chairman, Committee on Ways and Means (Thirty-sixth Congress); elected as a Republican to the United States Senate in 1861 to fill the vacancy caused by the resignation of Salmon P. Chase; reelected in 1866 and 1872 and served from March 21, 1861, until his resignation on March 8, 1877; chairman, Committee on Agriculture (1863-67), Committee on Finance (1863-65, 1867-77); appointed Secretary of the Treasury in the Cabinet of President Rutherford Hayes in March 1877, and served until March 1881; again elected as a Republican to the United States Senate in 1881 in the place of James A. Garfield, who had been elected President of the United States; reelected in 1886 and 1892 and served from March 4, 1881, until his resignation on March 4, 1897; Republican Conference chairman (1884-1885, 1891-1897); President pro tempore (1885-1887); chairman, Committee on the Library (Forty-seventh through Forty-ninth Congresses), Committee on Foreign Relations (Forty-ninth through Fifty-second Congresses, Fifty-fourth Congress); appointed Secretary of State in the Cabinet of President William McKinley and served from March 1897, until his resignation in April 1898; retired to private life; died in Washington, D.C., October 22, 1900; interment in Mansfield Cemetery, Mansfield, Richland County, Ohio. American National Biography; Dictionary of American Biography; The Yale Biographical Dictionary of American Law; Burton, Theodore. John Sherman. 1906. Reprint. New York: AMS Press, 1972; Sherman, John. Recollections of Forty Years in the House, Senate, and Cabinet. 1895. Reprint. 2 vols. New York: Greenwood Press, 1968.